Haunted Futures is a collection presenting the uncertain future in many guises. Originally funded as part of a kickstarter campaign and edited by Salome Jones it features short stories from authors including Warren Ellis, Jeff Noon, Tricia Sullivan and SL Huang (amongst others). 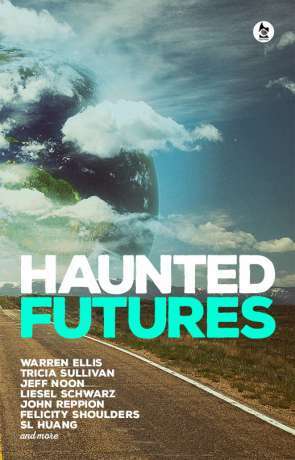 The brief these authors we given was simply "interpret the phrase Haunted Futures as a story". From over four hundred submissions, fifteen of the best were chosen. The style of each story varies greatly, as does the setting however they are all tied together with the often uncompromising, imaginative vision of the future. It's a strong collection and the varied styles work well. As with any collection there are some stronger and some weaker stories but there aren't any any that don't fit the brief. My favourites include Split Shadow by SL Huang, Guardian of the Gate by Lynnea Glasser and Mercury Teardrops by Jeff Noon. The first in the collection is emotionally charged story of a couple trying to piece together their daughters disappearance from her online orders. It's a thought-provoking and powerful story about loss, control and moving on. Retirement Plan describes a future of humanity following the aftermath of an alien invasion. The aliens don't appear to be present but their technology is and mankind seems to be in a bit of a bad way. The story deals with issues such as how society is quick to crumble after a cataclysmic event and how progress with civil liberty and equal rights soon disappear after the soft brown stuff hits the fast spinning thing. There are few authors and fewer stories that deal with the subject of mental health and I've got the utmost respect for SL Huang for writing about this little covered and less understood issue. In Split Shadow the treatment for many physiological issues is to physically seperate the psyche into the "good" part and the "bad". Becoming two different people the "good" go off and leave more productive lives while most of the "bad" die soon after treatment. Some endure however and Split Shadow follows one such survivor who creates a self-help group for others. It's a touching and thought-provoking story told with skill and grace, highlighting mental health problems are often treated as a boil to lance rather than a condition that is part of the psyche. This story is told through a series of letters from husband to his wife and examines just how far the perception of "art" can really go. It's a slowly building tale with a real shock of an ending. Tricia Sullivan is a gifted, often under-appreciated author and she exhibits her skill with this short. In this Haunted Future AR (Augmented Reality) is prevelant however this technology has attracted the dead who haunt the augmented living. It's dark tale but one told with a great deal of skill. Warren Ellis knows how to spin a story and Ghostmakers is clever little tale about a specialist department of the LAPD who respond to the worst murders with some unique equipment that gives them the edge. Comfort food isn't about comfort, or food - it follows a coder / system administrator who finds something that is either a ghost in the machine or the legendary Hiro Erikson. A clever little story that plays on the idea of the digital ghost. Like Split Shadow, Salvation features a subject matter rarely seen in genre fiction (or literary fiction for that matter), homelessness. It traces the path of a rich and successful salesman ending up penniless on the streets. It's got a few light-hearted touches with preventing it becoming too dark but still provides a cautionary tale. Guardian of the Gate is quite a different tale to all the others. It tells of powerful beings who have control over the "gate" that uplifted beings must pass through before reaching that plane of existence. These beings have the ability to make changes on a cosmic scale, snuffing out planets, star systems and whole galaxies when needed. They do such things to prevent anyone passing through the gate, which is an interesting answer to the fermi paradox. I loved the difference is scope this story provided, it's written well and entertains. As the name implies, this little gem imagines a future where you can take an illicit drug to gain the confidence of a secret agent - with variants known as A (Ames) and (B) Bond. As you might imagine B is stronger and more effective of the two. The brief story follows Albert and his relationship with girlfriend Breena, dealing with the topic of infidelity. Shift describes a future of living in the middle of a civil war. It's an interesting tale of graffiti, young love and accepting those who are different. A tale set in the middle of a graveyard, it's got all the hallmarks of a horror and has a style quite different to most of the others here. It's well writing and engaging. Science fiction and Noir is a great combination and Michael Grey really nails it with Future Noir. This story asks the question - what would happen if they managed to prove the afterlife really does exist? If life after death is a proven fact how would this effect society, technology and of course religion? Throw in an investigation of the first murder in 20 years and you have a really cracking story. Some time in the future the worlds gone to the dogs and some survivors live underground in Arks. Remember the sky tells us about life in two of these safe havens and skips forward in time from chapter to chapter. I liked this format, especially the little touch of showing the population of the Ark each chapter. The collection finale is a tale by the legendary author Jeff Noon and it's the ideal conclusion. Noon is at his best, describing a post singularity future where technology and humanity are well and truly merged. It's a love story that asks the question, what happens with such merged technology begins to fail? Written on 11th April 2017 by Ant.